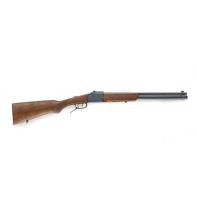 This shotgun/rimfire combination gun is a great choice for hunting, survival or fun recreational shooting. 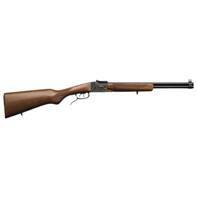 The Double Badger is available in 20ga/.22lr, to go along with the 410ga/.22lr and 410ga/.22WMR. 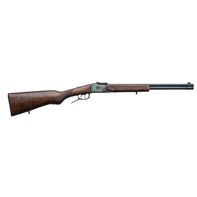 It has the look, feel and function of an over and under shotgun with an attractive wood buttstock and forend but with the versatility of a rimfire cartridge. Each barrel is selectively fired by its own trigger and controlled by a top tang safety that is easy to use quickly and reliably. The Double Badger comes with a Williams Fiber Optic Ghost ring and front sight as well as a 3/8” dovetail rail for mounting optics. Designed for portability, pushing the trigger guard down allows the Double Badger to fold in half for a total overall length of 21.20" making storage and transport easy.